What’s New in the Genetti Shop? If you haven’t visited our Genetti Family Shop in awhile, I have revamped the store, deleted some products and added a few things that I know you’ll really enjoy. Our mugs have been newly designed with several distinctive styles to choose from. Also new to our selection are iPad cases, spiral notebooks and hardcover journals. The shop itself has been pared-down and simplified to make shopping easier. And now all of our products (family tree prints, mugs, etc.) are produced by RedBubble as I feel their quality is superior to other printing companies. Click here to visit The Genetti Family Shop at RedBubble. Don’t miss out on our family history DVD, “The Genetti Family of Castelfondo: Our Journey to America.” Professionally filmed during Reunion 2016, this limited edition DVD is available through Bill Genetti. Visit our Shop for ordering details. Our Amazon Family Bookstore has also grown with new book selections about DNA Testing and Genetic Genealogy. This exciting avenue of research has opened up many possibilities for cousin matching, identifying ethnicity and understanding our inherited DNA. Visit our Bookstore and expand your horizons! And more exciting news, you can now order DNA testing kits through our website store! If you’re a novice or an expert at DNA testing, we offer a large variety of kits to suit your genetic goal, available from three major testing companies: Ancestry.com, FamilyTree DNA and 23andMe. All three companies offer the standard Autosomal kit ranging in price from $79 to $99. Want to delve deeper into your ancient ancestry or get a personal health report? You can find that here too! More extensive tests are available in our store from FamilyTree DNA and 23andMe. Click here and scroll through our shop page for DNA Testing Kits. Want to learn more about DNA? Check out our new page: DNA Testing and Genetic Genealogy. Here you’ll learn the basics, plus get some helpful links to additional information. Start 2017 with a special gift to yourself! Shop at the Genetti Family Store for unique items – and remember, every purchase helps support this website and ongoing family research. Last year I published a Christmas blog post about San Nicolò. It turned out to be one of my favorite posts of the year. Since we have many new subscribers to our site, I felt it was appropriate to republish the piece today in honor of our cousins throughout the world. Wishing you all a joyous Christmas! Did you know that the patron saint of Castelfondo is San Nicolò? That’s right, the church of our ancestral village is named after San Nicolò in recognition of an early christian saint who is the inspiration for Father Christmas, aka: Santa Claus. In English he is known as Saint Nicholas. San Nicolò di Bari lived during the 3rd to 4th centuries AD in a Roman colony that is now modern day Turkey. He died on December 6, 343 AD of old age. There are several legends and miracles attributed to San Nicolò. One in particular may be the beginning of the gift-giving tradition associated with Father Christmas. Upon hearing of a poor man who could not afford dowries for his three daughters, Nicolò (then the Bishop of Myra) gifted part of his wealth to the daughters in the form of three bags of gold, saving them from a life with no husbands and most likely, forced prostitution. To read the entire story, (which includes one sack of gold being thrown down a chimney!) I recommend visiting the site: Life in Italy. This informative page includes the historical details of San Nicolò’s life and the explanation of how his legend morphed into today’s Santa Claus. The photograph above pictures a prominent painting gracing the baroque altar of Castelfondo’s beautiful church. During my 2011 visit to the village, I was given a tour of San Nicolò by a lovely little woman who is the caretaker. She took me by the arm and escorted me around the altar, all the while describing paintings, frescoes and statues that adorn the church. Of course her explanation was in Italian! I nodded dutifully as I caught a word here and there. I was so appreciative that she had turned on the lights for us. Her obvious devotion to the church and the history it represented touched my heart. While she spoke, I could feel the spirit of my ancestors fill the pews. Generations of Genetti, Marchetti and Zambotti had worshiped in this church for hundreds of years! They had walked this very isle where I now stood. I’m sure they had a family pew where they knelt to pray, just as I had as a child in Hazleton, PA attending church at St. Gabriel’s with my father. I was awed and overwhelmed by that moment … reaching through time to share a moment with the ancestors who had shaped my life. As we gather with our families this Christmas, remember to thank your ancestors. Without their bravery, determination and Tyrolean values, our lives would be so different. How wonderful it is to know our roots and inherit a rich culture that we share with many cousins around the world. Buon Natale e Felice Anno Nuovo a tutti i miei cugini! Merry Christmas and Happy New Year to all of my cousins! A lovely video was posted recently on a Facebook group that I follow called “Chei da Chastelfon”. Created by Maurizio Mau Ruatti, it captures many of the beautiful memories shared by members of this group over the past year, most of whom are from Castelfondo or have roots in the village. 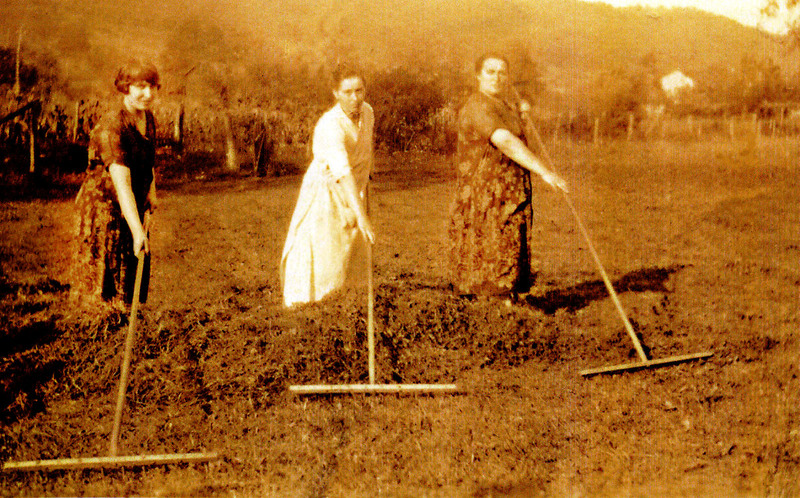 Some of our Italian Genetti and Marchetti cousins have also posted photos and documents on this page – and a few of their faces show up in this little video clip. 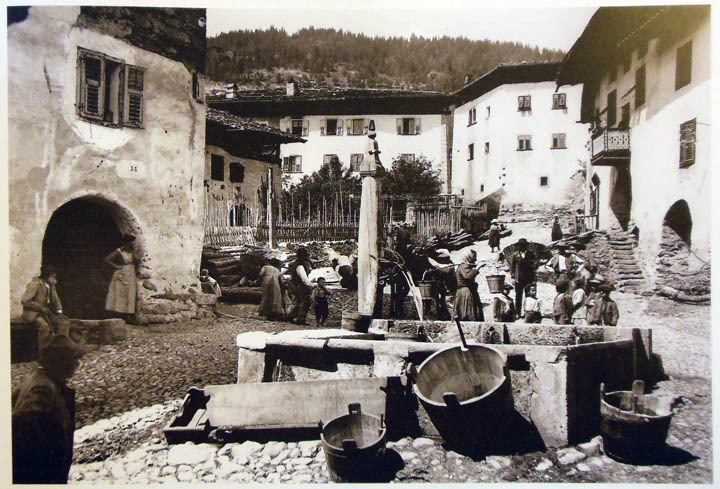 I have found this group to be a genealogy treasure of images and information – and such an amazing way to keep in touch with our family in Trentino. Although our cousin connection may be distant, their photographs peel away years and generations, touching our hearts with Tyrolean heritage. Mille grazie Maurizo Mau Ruatti! Your American cousins appreciate “Chei da Chastelfon, in video” and send our warm regards during this holiday season. My special thanks also to Giovanni Marchetti who leads this group. Giovanni has helped me with translating, identifying photos and has been very helpful with communications. Buon Natale a tutti! To view this video, you must be a member of Facebook and logged in to your account. Click here to view. The Santuario di San Romedio is an evocative and spiritual sanctuary located in the Val di Non not far from from our ancestral village of Castelfondo. Consisting of several chapels and churches connected by steep stone stairways, the ancient structure rises up from a rocky cavern. The oldest part of the Santuario dates back to about 1000 AD. I hope you enjoy a glimpse into one of the wonders of the Val di Non. We have shared this video from the Facebook page: I Love Val di Non. Thank you to Family Tree Circles for these insightful words of wisdom!